Shami had been thoughtfully studying the Usul all this while. This made the captain nervous. “What do you want?” he asked her. Their brother, Flyer_Troy, worshipped Garin. His room was full of posters and the only books he ever read with interest were the ones about pirates. Garin was taken aback by this statement. Most people trembled in fear when they saw a pirate ship. And these were girls! Garin went for his maractite dagger, but stopped. “I can’t hit a girl!” he exclaimed. “Guess what?” Shedars said. “I can hit you.” She hit him with her tail and sent him sprawling to the ground. “You fight okay. All right, I won’t throw you overboard.” Garin figured they might be useful one way or another. Shedars explained what had happened. “So I suppose you want transport to Krawk Island,” Garin said. “That’s exactly what we want,” Shami said. “Krawk Island is quite near here!” Lallinara protested. Later that night, there was a full moon. The only people on deck were Shedars, Lurina, and though they didn’t know it, Garin. He had been suspicious about them from the start. The storm had been fierce and there was little chance anyone thrown overboard would have survived. He hid behind a barrel and listened to the conversation. “Hurry up, Shedars!” Someone said in a whisper. Garin assumed it was that striped Xweetok called Lurina or something. There was a flash of green. Garin looked over the top his hiding place. This light was strange. It glowed brightly, but instead of illuminating objects, it made them darker. He gulped. This was dark faerie magic. It enveloped that ghost Xweetok and for a second, she solidified into a Xweetok with green and purple fur. Garin jumped and turned to the sound. He saw that Shami was kneeling beside him. How she had managed to sneak upon him, he had no idea. The light was completely gone now, and Lurina and Shedars were heading below deck. Garin realized this a bit too late. Any second now, they would pass see him as they passed. His head filled up with horror images of what Shedars might do. Shami must have noticed this. “I told you there’s no need to be afraid of her!” Then she did something that nearly made Garin’s system shut down. She stood up and talked to them. Garin stood up beside her, a bit embarrassed. He avoided the two Xweetoks’ glares. He didn’t usually back down like this, but the sight of Shedars freaked him out a little. She looked scary in the moonlight, especially with that slight green glow. They left together. Garin couldn’t help but feel a bit relieved. “I told you not to follow them,” Jacques said. He was slightly better at stealth than Garin. Scarblade (bet you were thinking when he’d make his appearance, huh?) scowled. He was thinking of his humiliating defeat at the hands of Garin. His crew was wisely keeping their distance. Scarblade turned. It was Benny. He was holding... a pink petpet. The Bruce tugged at an envelope in the creature’s beak. He freed it and gave it to Scarblade, who tore it open. It was from that wimpy Gelert who lived on Krawk Island. He had been allowed to live as he usually provided Scarblade with good information. Scarblade read the letter. Meanwhile, on the Black Pawkeet, Garin was deciding what to do with those girls. They helped around the ship and earned their keep, but he was still a bit apprehensive about Shedars. The Ghost Xweetok rarely used her hands to do anything, but instead levitated everything. It was a bit unnerving. Unknown to Shami, someone had seen it. That someone was a pirate uni flying overhead, who belonged to Scarblade’s crew. His orders had been to look for magic. The letter had contained information about a magical disturbance on the sea. There were always some traces of magic in the sea, mostly water faeries. But this disturbance was (somewhat tainted) dark faerie magic. In Scarblade’s mind, dark was always equal to evil. 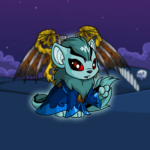 And as the magic was tainted he had come to the conclusion that this was a neopet, not a faerie. The disturbance was, of course, Shedars. Scarblade’s plan was to recruit the neopet and after defeating Garin, to destroy Maraqua. The Uni only saw Shami next to the levitating broom and concluded that she was the one who possessed powers. He flew back to report it to Scarblade. Scarblade didn’t believe it. Somehow, every time he found something of limitless power, Garin always got to it first. He began making plans for the attack. In between, he smiled maliciously. There were five females aboard Garin’s ship. He must have been going soft. Garin was looking at the sunset. There was a sudden cry behind him. “Captain, the Revenge has been sighted! Scarblade is coming towards us!” It was Talak, the orange Wocky. “Oh, you’re not going to do that.” Shedars materialized beside him. The Revenge drew up beside the Black Pawkeet and the deck was soon a battle field. Garin noticed that every time an opponent’s blade came too close to one of his crew, their own blade glowed green and lifted up, blocking the blow. After a while the green grew a bit faint. This was alarming. They were outnumbered and without that magic, they would surely lose. He was surprised by the skill the Striped Xweetok displayed. Lurina. Her blade was a blur as she fought. Nowhere near as good as he was, but still good. The Blue Xweetok Lallinara, on the other hand, was having a bit of trouble. The Uni Loranisa flew overhead, fighting with one of Scarblade's Unis. Now and then, she would dip down and kick someone on the head. Garin wouldn’t say it, but they were pretty good.